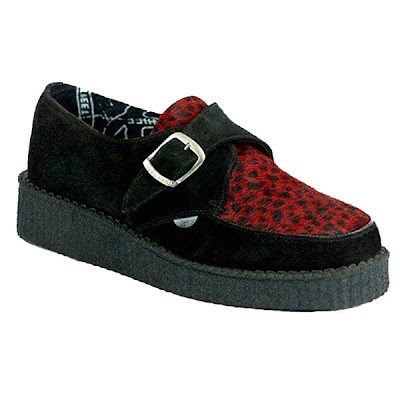 A staple of Teddy Boys in the 1950s and their 1970s revival, taken on by Westwood and McLaren for a new generation of punks, and an accessory adopted by a number of other subcultures since, the Brothel Creeper is a shoe that makes quite the visual statement. Traditionally a suede shoe with thick crepe soles, the shoe finds its way from the humble desert boot. Crepe soles were perfectly suited to traversing sandy landscapes, providing a hard-wearing and comfortable platform for soldiers, or indeed explorers, stationed in North Africa and the Middle East during the Second World War. They went on to provide comfortable service to their wearers as the landscape changed from windy deserts to sweaty nightclubs. Quiet and comfortable, the brothel creeper is a style statement derived from the practicalities of the desert boot. Of course since the 1940s the desert boot has become a style staple far removed from its original setting, and indeed one notes the resurgence of the iconic design with the amazing Clarks Originals range (a pair of their antique brown leather desert boots have been on my wishlist for quite the while now). The crepe sole has now become the favourite of all those wishing for a comfortable yet stylish shoe, and curiously enough, although perfectly understandably, for librarians too. However the design of the brothel creeper, with its stacked sole and often woven upper, is somewhat more dramatic and far more stylized than your average desert boot or crepe soled shoe. 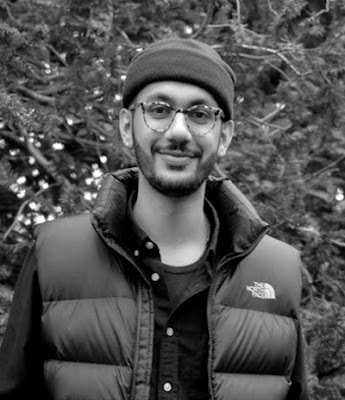 Indeed it immediately evokes images of youth subcultures, musical movements and something a bit more rebellious. Chunky d-ring placements on laced versions, or else fat monk straps, perfectly suit the thick soles, and indeed there is an oversized aesthetic that dominates the design. Yet it was often paired not with oversized clothing, but rather used to offset drainpipe trousers and sharp Teddy Boy tailoring. Mention brothel creepers and one immediately thinks of George Cox. In 1906, George James Cox founded his shoe company in the heart of England's shoemaking region, Northamptonshire. Crafting high quality traditional footwear at first, the company quickly gained fame for the iconic styles that would come to inspire generation after generation of subcultures. From the brothel creepers of the 1950s to the winkle pickers of the 1960s, George Cox have never been shy of the more dramatic shoe design. Over a hundred years later and the company still produces delightful underground styles. 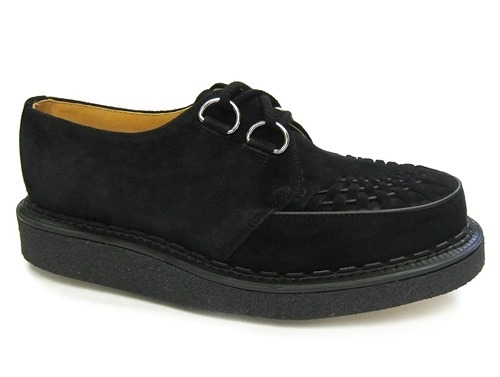 Indeed I would happily invest in a pair of George Cox shoes for the history they embody alone. Whilst the traditional black suede version is perhaps the most popular version, I am quite the fan of the slightly more creative designs. I am particularly drawn towards the red and purple suedes, as well as the leopard print style (I have actually been on the hunt for a good leopard print sweater too oddly enough). Whilst I find the d-ring style interesting, I have to admit that I am more the fan of the monk strap - there is something about the oversize shiny buckle that contrasts nicely against the softness of the crepe sole. Of course the traditional brothel creeper can be rather loud for everyday wear. 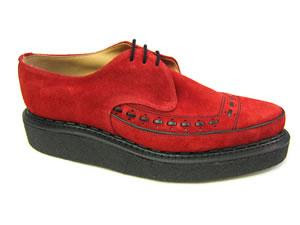 The stacked soles in particular, whilst being quite integral to the style, are perhaps not the easiest look to carry. I would much rather wear something less severe, and thankfully there are a number of less dramatic versions to be found. My particular favourite comes from the Clarks Originals range, in the suitably dark and rebellious design of the Ashcott Monk shoe. I had no idea these were called BROTHEL creepers! Or that they had historic origins. What a fun lesson in footwear. My brother would totally rock these! 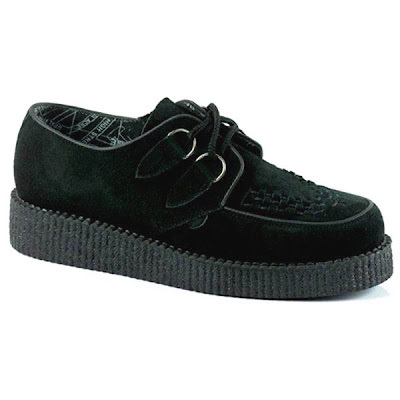 i've never been a huge fan of creepers on myself but love seeing them on those that can pull it off. I love the Clarks pair, they are dapper. i have always loved creepers, things with such interesting roots and links with subcultures, i love it. too many essays maybe. my best mate bought some george cox creepers on ebay but he can hardly walk in them. 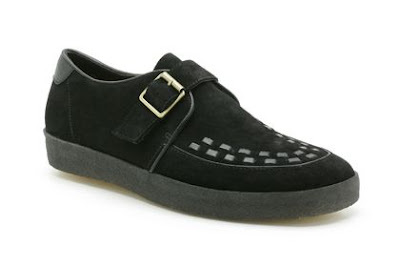 but now that clarks and bringing out a range, this has got my very excited. i still don't think they would really go with my current style but who cares right?